Our NewsCast is all about discussing the latest in gaming and movie news. We don't just report the news, we a talk about it until we're blue in the face. What we're playing, watching, or doing in and around the nerd world. Have questions for us? Ask them. Post to our Facebook, Twitter, or Discord and we'll answer you live on the show! Want to see us play games? Well you're in luck. When the boys find time they'll stream whatever game they can get their hands on for your viewing pleasure. CHECK TWITTER OR DISCORD FOR WHEN WE GO LIVE! Come and chat with us online and get the latest updates as soon as we know them. 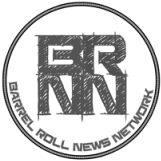 Join, like, subscribe or do whatever else these lovely sites want you to do so you can stay up to date with Barrel Roll News.